STEREOTACTIC THALAMOTOMY OF NUCLEY.CM, PF AND DM IN PAIN. ENRIQUE RUBIO GARCIA. in intractable pain by medical and surgical procedures. Fundamentals of the effectiveness of these lesions. percentage of patients with contralateral dysesthesia unbearable for the patient. features were consistent with the known Dejerine-Roussy syndrome. Traducir The observation of animals allows to see two types of systems of conduction. sensations that did not secure therapeutic action (8174,201,224). the pain threshold and the patient was often heard to say that pain no longer mattered. conveys the pain informing the prefrontal lobes of the emotional component of pain. resistant to all known medical and surgical procedures. from the Atlas Schatelbram and Bayley. Z. – lll Paret external lateral ventricle. 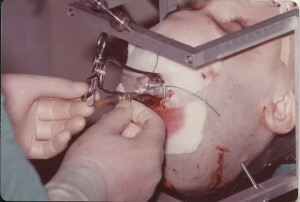 The lesion began cooled off the tip of the cannula to reach 200 degrees below zero. pain. These patients lived longer and it determines recurrence of pain. then I stopped worrying and let them live with some comfort. produces a high percentage of analgesia. Immediate to the surgery. 2 .- After two week the good results are reduced to 70%. syndrome allowed them to live more confortable. lower in patients suffering deafferentation pain. them (postherpetic neuralgia, brachial plexus Chunking). TALAMOTOMIA ESTEREOTÁCTICA DE LOS NÚCLEOS CM, PF Y DM EN EL DOLOR. ENRIQUE RUBIO GARCIA. analgesia en los dolores intratables por procedimientos medicos y quirurgicos. proyecciones contralaterales de las vías sensitivas. conoce como vías extralemniscales de las sensibilidades (43,150,174,198,). superficiales y escasamente dolorosas . núcleos intralaminares del talamo (184,185). informándoles del componente emocional del dolor. con la siguiente localización, extraidas del Atlas de Schatelbram y Bayley. llegar a 200º bajo cero. el postoperatorio mas desaferentizacion que analgesia. tiempo y ello condiciona la recidiva del dolor. estado, como la mayoría de los pacientes tumorales operados. produce un alto porcentaje de analegesia. Inmediata< a la cirugía. 2.- Pasadas dos semnas los buenos resultados se reducen al 70%. indiferencia del sindrome frontal les permitio vivir mas bondadosamente. mas tiempo después de la intervención los resultados fueron claramente peores. (neuralgias Posherpeticas, Arrancamiento plexo braquial).